This is a 1st person, point and click game considered to be Haruhiko Shono's masterpiece. The game is really a modern-day work of art and was way ahead of its time. From the strange mood music and realistic sound effects to the detailed atmospheric 3D settings and the haunted, disturbingly real-looking people (but with subtitles only: no voice, except for the introduction and ending), the story reminds you of one that is a cross between Jules Verne and George Orwell, and the game itself appears more modern in many respects than some of the newer releases today. It is the disturbing mood that the developer has managed to create in this game that really grabs you. As the game begins, you awaken in a hotel room feeling as if you're suffering from some illness that is affecting your mind, and you are not sure what is real. Meeting an enigmatic and somehow threatening man in the lobby who is apparently your boss, you are told that you are to contact an agent with the codename 'Horselover'. He is a member of a strange group of scientists being watched by the government and, at a secret research facility, he has been conducting mind-altering experiments and they have built a spaceship to escape. Ostensibly your world is about the be destroyed by a Comet, and you are the only one who can save it. Or is it really? Is this just a story that has been created by a fringe group for their own purposes? Or maybe it's just a figment of your own fevered, mind-altered imagination. To find out, you must travel deeper and deeper into their surrealistic world. You must race against time through abandoned and eerie train stations, talk with many obviously disturbed fellow travelers on those trains, stop at the Museum of Science and operate strange and powerful machines, and even pilot a monorail, airplane and spaceship yourself. And even when it is all over, will you really know the truth? 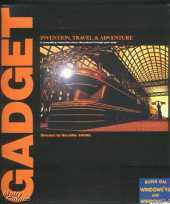 The 1998 4 CD re-release Gadget: Past as Future is described as an unabridged version of the 1994 single CD release, and has enhanced videos and music upgraded from 8 bit to 16 bit.